PT Media Televisi Indonesia – Metro TV is a reputable broadcasting company in Indonesia. Metro TV pioneer in news-based free to air broadcasting television station. The Company operates Metro TV as its segmented broadcasting television station with news sector around the world as its main subjects. 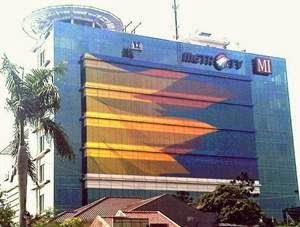 Metro TV also known as the first television channel in Indonesia that operates 24-hour non stop. Metro TV's broadcasting license issued in 1999 and officially aired on 2000. PT Media Televisi Indonesia is a member of Media Group, one of the biggest media holding companies in Indonesia owned by tycoon and politician Surya Paloh. Based in West Jakarta, Metro TV operates 53 transmission sites throughout Indonesia. Metro TV also supported by approximately 1,200 dedicated staff, mostly in the newsroom and production areas. Strong interest in broadcast industry, digital media, and creative event organizer. Creative, result driven, and target oriented. Agile, good communication and interpersonal skills. Social media minded and digital savvy. Diploma Degree (D3), majoring in Broadcasting. Minimum height of 170 cm. Have perfect eyesight and not color-blind. Strong interest in Broadcast Industry and Journalism. Agile, good interpersonal and communication skills. Fluent in English, both written and spoken (Min TOEFL Score of 550). JobsCDC.com now available on android device. Download now on Google Play here. Please be aware of recruitment fraud. The entire stage of this selection process is free of charge. PT Media Televisi Indonesia – Graduate Development Program Metro TV February 2018 will never ask for fees or upfront payments for any purposes during the recruitment process such as transportation and accommodation.